If winners never quit, does it mean winners are those people who start something are eventually are winners at it? “Winners never quit and quitters never win” – often we get this wrong because I don’t think winners don’t quit, they just don’t give up but they do quit. First if winners never quit may mean winners are those people who start something are eventually are winners at it. So you tried doing something, and if it is not working for you, you just go on and on and on with it unless it starts working for you. I don’t see anything like that being the case with anyone. Let me share with you a small story. I was having a debate with one of my old buddy about me being part of his project and vision. We had a discussion where I had a feeling that it would not work out and so I did not want to be in it. After a few convincing counter arguments, the discussions went in a direction about winners and loosers. Winners don’t quit and you are quitting without even trying and blah blah blah. The end result was I could not convince him to quit and he could not convince me to become part of his idea. 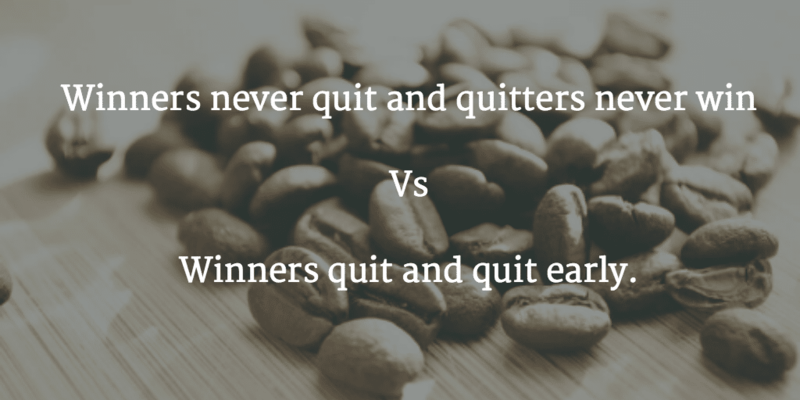 Normally it happens with such a dialogue but the point of this blog post is to understand if winners never quit or winners quit and quit early? In such a debate, we always have examples of people who just went on with what they believed and this discussion was no different. We had an example of Henry Ford in our conversation. His argument was he failed so many times before he could make it and what if he would have said no just before the ultimate time. But I look things from a different perspective. He did not quit his idea but then he did quit all the partnerships that he formed with people that were not allowing him to work like he wanted to. So you can always quit and quit early but not give up and try things differently. So should you be quitting or you should be sticking to something that is not working and make it work for you? What did you quit? Share your thoughts in comments below. I quit lot of things. I did quit sites like CFanatic.com (merged with go4expert now), club-google.com, GlobalDevelopers.net and many others. I also had numerous partnerships apart from WebOrbit that did not work I did quit them and quit them quite early. I did quit my job which was paying me well over 6 Lacs Rs as yearly compensation. I did quit windows and moved to MAC. Recently and the most important one, I did quit Kolkata (and moved to Surat). And the list can be quite long and go on and on and on.